I’m aiming to be sugar free for the next 30 days. Who wants to join me? Why? Just feel like I want a break. And I definitely eat too much of it. And diabetes runs in my family, so I might as well get in some practice early, right? Too bad I inherited a sweet tooth. I think I’ll go with level 2…maybe a little less fruit, though I believe fruit in moderation is good for you. The challenge I see coming: The office candy bowl, constant junk food on any available surface. 1.When the craving begins, set a timer for 15 minutes. Most cravings last only eight to 14 minutes. 2. Drink a full glass of water. Thirst is often mistaken for hunger, says Klauer. 3. If the sugar craving persists, eat a protein-rich snack, such as handful of almonds or walnuts, some unsweetened yogurt, or a piece of cheese. Add arugula, radicchio, endive, or chicory to your diet–bitter balances the need for sweet. Warning, these are decadent. And perhaps not a health food. But you can cut them small. But they were a hit of the Christmas party circuit. I recommend freezing or refrigerating them until you are ready to serve them. The inspiration comes from Fine Cooking Magazine’s cookie issue. But they tell you to bake off a shortbread cookie crust first. I didn’t feel like doing that so I repurposed some cookies I had laying around. What Fine Cooking’s cookies looked like. Mine were pretty close, too. I just didn’t take a photo. The original recipe tells you to use a mixer for this, and perhaps you should. I was too lazy both times I made this and just used a fork to perfectly good results. Mix your butter and sugar together until fluffy. Add in your peanut butter and mix. Heat up the cream on medium. When it bubbles and is hot, add in your chocolate chips. Lower the heat to simmer and stir constantly until it makes a smooth, shiny ganache. Pour over your now cold peanut butter. Return the pan to the freezer for a half hour or to the fridge for at least an hour. Cut into small squares. I put each square into a cupcake liner. I discovered a trick to really good oven baked sweet potatoes recently. The microwave. Cooking the potatoes first and then crisping them in the oven leads to really good results and in a much shorter amount of time. The microwave dries them out a bit, too. Chop the sweet potatoes into small pieces. Rub them with olive oil, salt, and a little bit of chilli powder (you can skip if you don’t want them to be spicy). Microwave them for about 3-4 minutes. You want soft but not mush. Throw them onto a baking sheet and roast them off until crispy. The trick here is massaging the kale in olive oil in a ziploc baggie for about 5 minutes. Oh and this recipe is mostly about the dressing–the salad itself is pretty basic. Be creative. This one of those “throw everything into a bowl and toss” salads. Be creative with the ingredients–other veggies, such as spinach, snap peas, broccoli slaw etc would work well too. dressing: whisk up all of the ingredients. Add more olive oil or a drizzle of water if it’s too thick. This is my mother in law’s recipe (aka my maamiyaar in Tamil). She made it when we were down in Tampa last week and we loved it so we got the recipe and made it again today. Chop and sautee onion until golden. Blend the soup or use an immersion blender. Add in the remaining coconut milk and lime juice to taste. Add salt, pepper, and red chili flakes to taste. New year, new posts! Happy 2015 everyone! This year, I’m going to try harder to post once a week. Let’s not call that a resolution…just a goal. Since I’ve been remiss for a few busy months, I’ll give you a batch all at once. This isn’t really stuff I made today (with the exception of #2, Maamiyaar’s soup). 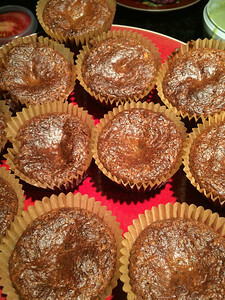 I’ll start today’s marathon posting session with some recipes I’ve made over the past few months–butternut squash featured heavily into several of these recipes, it being fall/winter after all. Oh and then there’s my favorite new dessert of the christmas cookie season: Peanut Butter Chocolate Shortbread bars. Mmmmm…. Inspirations for these came from many places…magazines, books and my own head. I hope you enjoy! If you saw the previous recipe, you’ll know that we still had half of a kuri squash already roasted. What does one do with that? Well, if you’re and have a bevy of visitors traipsing through the house (aka campaign central) all the time, a healthy-ish dessert to go with coffee sounded like a good idea. I quickly browsed some recipes for pumpkin pie made from fresh pumpkin and really didn’t like the amount of sugar they called for, nor the other random ingredients (evaporated milk, several eggs). Also, I like a good pumpkin pie, but a lot of them have this weird congealed, gelatinous texture that I surmise comes from the eggs/evaporated milk. The crust I made from what I had in the pantry–a stack of graham crackers, some butter biscuits, and a little almond flour. So I set out on my own. “How bad could it turn out?”, I thought. And well it was GOOD. So good that today, two days later, it’s all gone. In a food processor or blender, break up the graham crackers and cookies into crumbs. my vitamix did this in about 15 seconds! You can melt butter or do what I did–pour the crumbs into a pie plate lined with parchment and chop up softened butter and put it on top. Throw it into the oven til the butter melts and then mix it up. Scoop out squash into blender container. Pulse until almost smooth–i left a few chunks for texture. Spoon out into a bowl. Pour the pumpkin mixture into the pan. Bake for 15-20 minutes at 350. I found mine was a little moister than I wanted, so I lowered the temperature to 250 and baked for another 15 minutes, which yielded the perfect texture. Keep checking on it at this stage…you don’t want dry or leathery…just firm enough to cut neat slices. Fancy, no. Tasty? yes. Next up in line was the red kuri squash I bought, which was supposed to have a sweet flesh and taste kind of like a pie pumpkin. It was big enough to make 2 dishes–a pie (next up in the post list) and a faro dish. Why faro? The husband and I both like it for its chewy texture and its ability to pick up flavor from anything you make. In past years, I’ve made a butternut squash risotto using forbidden/red rice or purple rice, so Faro was a natural next step. Add the vegetable stock and cook the faro over low heat for 10 minutes. When the squash is soft enough to cut/scoop out, cut half of the squash into cubes and add it into the faro mix. Add in coconut milk and cook until the squash has softened. In a skillet, melt the butter and let it brown. Add in the sage leaves and fry til crispy. It’s October and pumpkins and squashes are everywhere, so pumpkin & family recipes are on the menu, too. 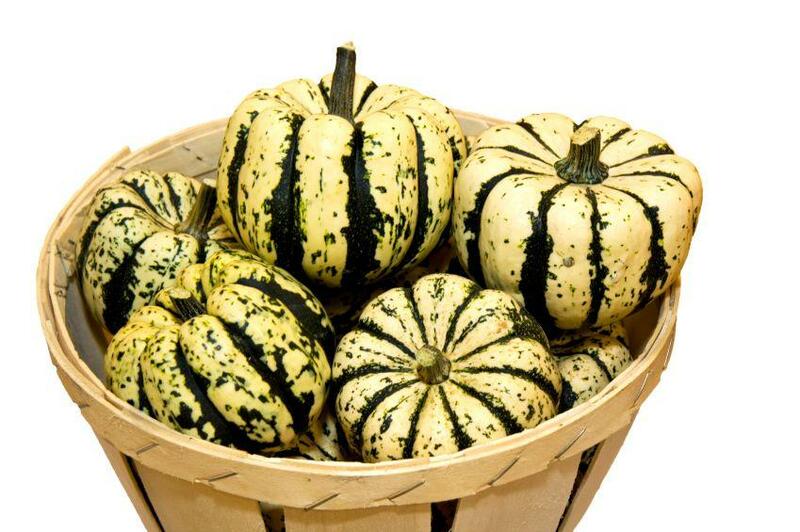 (When did pumpkins go from cool things to carve to “the” thing you must display and cook with all fall/winter long? They do make a good meal though.) The display at our wholesome organic megalopolis included dozens of varieties I wasn’t familiar with, including a “red kuri” squash and the “sweet dumpling” squash that I picked up. (In case you are wondering what these varieties are, Epicurious and Real Simple have good guides). This recipe started with a “Roasted Butternut Squash Pie” recipe on Epicurious. It featured filo, which I didn’t feel like dealing with, so I changed it to a blue cornmeal-almond meal crust. I also added in Kale and pumpkin seeds. Wrap the squash in foil and and bake until soft. Chop onion and scallions and sautee them with the garlic and ginger paste. Chop spinach into ribbons and add to the onion mixture. Chop bell pepper into small pieces and add it in to the onion mixture. When squash is soft, scoop out the flesh and add to the onion/spinach mixture. Cook for a few minutes. Reduce oven to 350. In a mixing bowl, combine the almond meal and cornmeal. Add olive oil and mix. Add water and mix by hand until it forms into a dough ball. Roll out the dough between pieces of parchment (you should have enough for a top and bottom. complete coverage on top is not necessary–if it ends up being cobbler-style patches, that’s fine. Line a baking pan with parchment and put in the bottom crust layer. Add pumpkin mixture on top. Sprinkle walnuts on top. Top with a top crust. Bake at 350 until crust is golden. These aren’t your typical huevos rancheros. This is part of my is pantry/fridge challenge–use up ingredients you have. The ingredients: a sad looking avocado. A sweet potato needing to be used up. Some taco shells that happened to be out. Lentils that had been cooked the week before. Husband said he wanted eggs, soft boiled or poached. I went with soft boiled, because I didn’t feel like dealing with the precision required for poaching. Note: you can play the pantry/fridge challenge too. leave comment with an ingredient you want a recipe for. I’ll try to oblige. My next party trick is purple cauliflower. After washing your sweet potato, swaddle it in a paper towel. Soak the paper towel and stick it in the microwave for about 4 minutes. (take a peek after 3). You want to be able to be soft enough to cut into pieces, and to come out of the skin easily. Chop up the sweet potato into bite sized pieces. Soft boil your eggs (i used an egg timer…and they were perhaps medium boiled. I might have preferred them a little runnier). You could poach them..I just didn’t feel like it yesterday. While the eggs are cooking, chop up your avocado and put it into a bowl. Chop scallions and add them to the avocado. Add some lime juice to that dish. Lay the taco shell on your plate. Smear your lentils on top. Then add your sweet potatoes. Top with avocado, then greens, then some shredded cheese. Pistachios were just for crunch. Place your eggs on top of this mound. salt/pepper your eggs as you wish. you could add salsa, but this version didn’t seem to need it. It was my turn to host book club tonight. We read “The Hundred Foot Journey,” a visual book about an Indian boy who migrates to small town France, becomes a chef in a family Indian restaurant, and then becomes apprentice to an exacting (and somewhat bigoted) classical French chef. 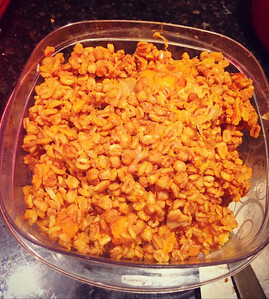 So…I made Indian (bhel puri) and Indo-French snacks…the apricot tarts fit in the latter category. 1 stick of butter, softened (ok so yes, these might be kinda paula dean-ish. but they’re a “sometimes” food. I used organic unsalted butter. Mix the flour and butter together with your hands to form a dough. It should come together and form a ball. If it’s too dry, add a little milk, a teaspoon at a time. Roll out between pieces of parchment, about 1/4 inch-1/8 thick. Cut into 2″ rounds with a cookie cutter. Lay out on parchment lined cookie sheets. use a spatula to transfer them. Spread a teaspoon of jam onto each of the tarts. I love fresh figs in the summer. So I bought a bunch the other day. I also bought an apricot Stilton cheese that I didn’t really like. And then had to come up with something to take to a colleague’s house a few days later. 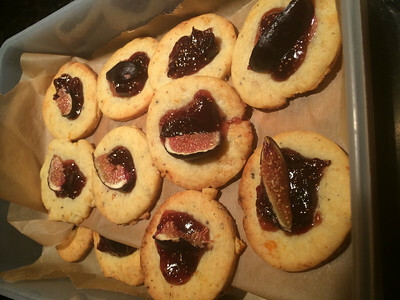 Enter: Fig and cheese savories, a take on this recipe. They’re easy and really tasty. Maybe not so good for you. But they were for company! Use a 2″ round cookie cutter to cut out “cookies” and place them on the lined baking sheet. Spoon 1/2 teaspoon or so of fig jam onto each round. For Neefu’s birthday, I decided to make something a little special–birthday doughnuts. I didn’t really have much time, and not that much by way of ingredients, but I wanted her to wake up to something special, since she’s been helping K so much. I also wanted it to be tasty, and yet at least semi-healthy, so I made some substitutions: some whole wheat flour, agave syrup instead of sugar (I’m still not sold on fake sugar, though I’ve been trying–that aftertaste, yuck. though maybe one day I’ll get there). 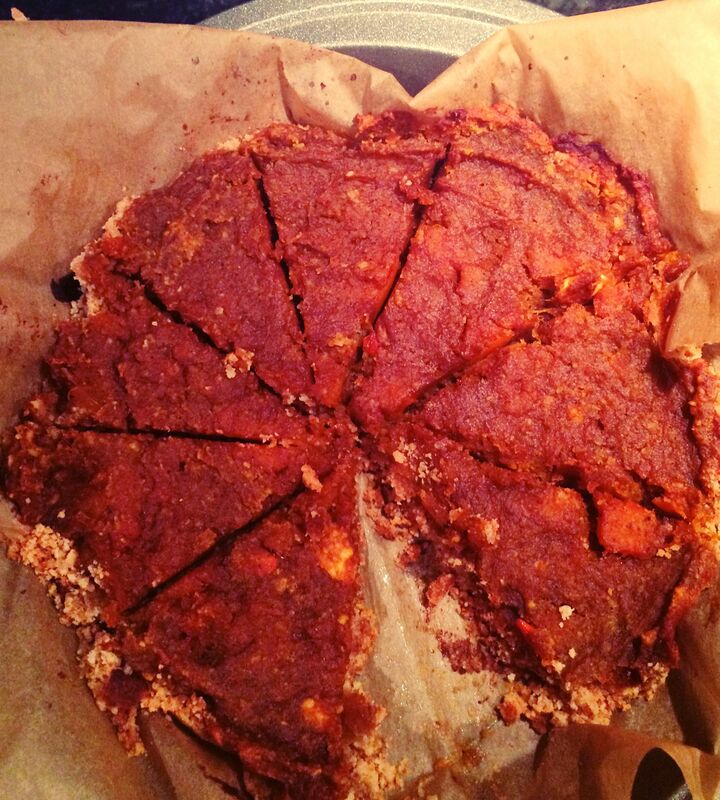 ◊ modifications: agave syrup, changing the balance of wheat and AP flour, and adding in some almond flour too. oh and cocoa powder! Pour the mixture into the doughnut pan. fill each well half full. bake for roughly 6-10 minutes. I’m posting two versions–the method I actually used, and one I think might be easier. Why? I cooked the fruit with a bit of almond paste (no cream) first, and thought it was a little bland, so I made an almond cream, pulled the fruit out, piped it in, and replaced the fruit. This method tasted amazing, but was a bit tedious, and the fruit wasn’t bright (as it was when it was raw). Add a small nub of almond paste to each tart shell–you just want a thin bit to taste. pit cherries. slice cherries into small bits. add 3 blueberries and cherries on top.